As the hockey season draws to an end, ECHL player Zachary Yuen decided to journey from Richmond, Vancouver to here in Hong Kong for a short stay. Though born and raised in Canada, Yuen’s family still have strong ties with Hong Kong, and he is excited to share his unique experience as a Chinese professional hockey player with the young participants of the Jockey Club Generation Next Program. decided to journey from Richmond, Vancouver to here in Hong Kong for a short stay. Though born and raised in Canada, Yuen’s family still have strong ties with Hong Kong, and he is excited to share his unique experience as a Chinese professional hockey player with the young participants of the Jockey Club Generation Next Program. Hockey skills, however, is not the only thing Yuen wishes to teach. The Jockey Club Ice Hockey Generation Next program emphasizes, above all, the aspect of personal development in the young people who are participating in the program, and so far, it seems to be working. “The generation next program is in great hands from top to bottom, and with this, the kids will come out of the program not only as better hockey players, but most importantly, better people.” Yuen said. Yuen’s hockey career started at the young age of 2, when he declared his dream of one day being a professional hockey player. Since then, he has worked tirelessly towards that goal, and was finally drafted in the NHL by the Winnipeg Jets in 2011. 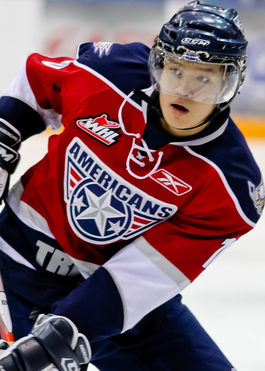 Yuen is currently playing in the ECHL with Dallas Stars affiliate, the Idaho Steelheads, leading in goals as a defenseman on his team. Mr. Yuen started playing hockey professionally in the WHL at the age of 15, and went on to represent Canada at the World U17 Hockey Challenge. He also represented the Canadian Hockey League All Star Team to compete against Team Russia in the 2011 SUBWAY Super Series. To share his rich playing experience with the young players in Hong Kong, Yuen is set to run a 4–day summer hockey camp in association with the Jockey Club-funded Generation Next program at Mega Ice, MegaBox. The camp, starting on August 8, 2016 will focus on elements such as body-checking, skating, puck-protection, and other critical skills. The last day of the camp will feature a public clinic aimed at promoting the sport to a wider spectrum of players.